Nobody will guess that this sweet toffee starts with graham crackers. Brickle Bars are the next best thing to homemade candy! I had a friend coming over for coffee at lunch today, and having no baked goods in the house, this is what I made! These only take 10-13 minutes to cook, and in less than 20 minutes I had a very yummy treat to put out for us. Unfortunately she only ate one, now I have about 3 dozen more to eat. Good thing there are plenty of people who happily take extra treats off my hands! Line your sheet pan with parchment paper or foil. Break your graham crackers into fourths, along their natural perforated marks. Line your sheet pan with crackers. In a small saucepan, bring your butter and sugar to a full rolling boil. Pour over crackers. Sprinkle with chopped pecans. Bake in a 350 degree oven for about 12-15 minutes. Remove from oven and immediately use a small spatula to transfer hot toffee to a piece of parchment paper on the counter. Melt chocolate according to package, spread over toffee. Allow to set and cool (about 15 minutes). A large baking sheet, approximately 15×10-1-inch. Make sure it has the 1 inch sides, so your gooey caramel doesn’t drip into your oven! Our family calls this a jelly roll pan! I use this small serve spatula to remove the toffee from the sheet pan. Parchment paper. Do not skip this step or you won’t be able to remove your crackers from the pan. You could use foil as well, but I don’t like that it will sometimes rip. I buy my parchment paper in bulk either on amazon or at Sam’s/Costco. 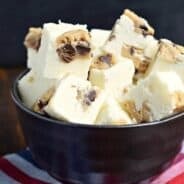 S’mores cracker toffee is a little bit of summer on a slice of toffee! So easy and delicious. 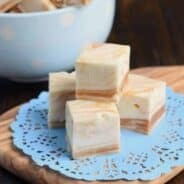 Want traditional toffee? 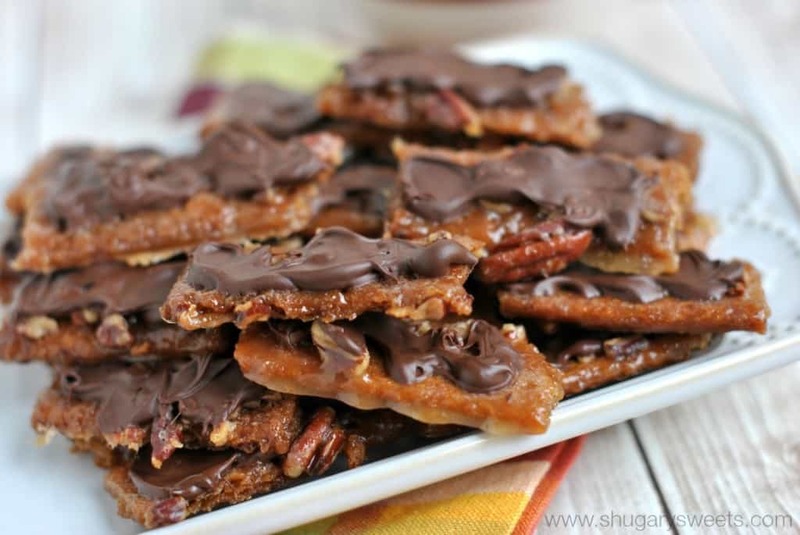 My English Toffee recipe is just perfect, everyone begs for the recipe! Break grahams into fourths. Line 15x10x1inch pan with crackers. Pan melt butter and sugar. Bring to a boil over medium high heat, remove immediately and pour over crackers. Sprinkle with nuts. Bake in a 350 degree oven for 12-15 minutes. Remove from oven and transfer to parchment paper. The best way to do this is using two butter knives, or a small spatula. Scoop each graham cracker individually and transfer to parchment. Repeat until all grahams are moved to paper. Spread melted chocolate over each brickle bar. Allow to set. Store in airtight container. 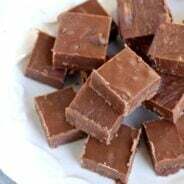 **This Brickle Bars recipe was originally published on Shugary Sweets on January 27, 2011, the photos were updated in October 2014 and the recipe was republished in April 2018. These look and sound great! I love that they are so fast! I have never had these but they look so yummy.. and sound easy! I can’t wait to try! I want to try these – they look really good. Could I just leave the bars whole and break them apart after they have cooled? You could, but they would crack and not look as pretty for sure. Plus they would be harder to transfer to the parchment paper to cool. I leave them in the pan when I do this. I just break them apart and all different shapes. It’s much easier that way. These do look prettier though, lol. No. I tried and they burned. Use butter. It works. Couldn’t you just line the baking sheet with parchment to begin with? That way you don’t need to transfer them. You could totally do that!I would make sure you trim the parchment to fit the pan, that way the crackers lay nicely. ENJOY! 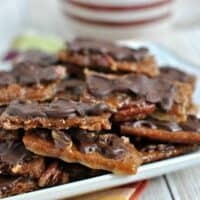 Pingback: Butter Pecan Crunch Candy - Chocolate Chocolate and More! Would it work to use margarine for this recipe? 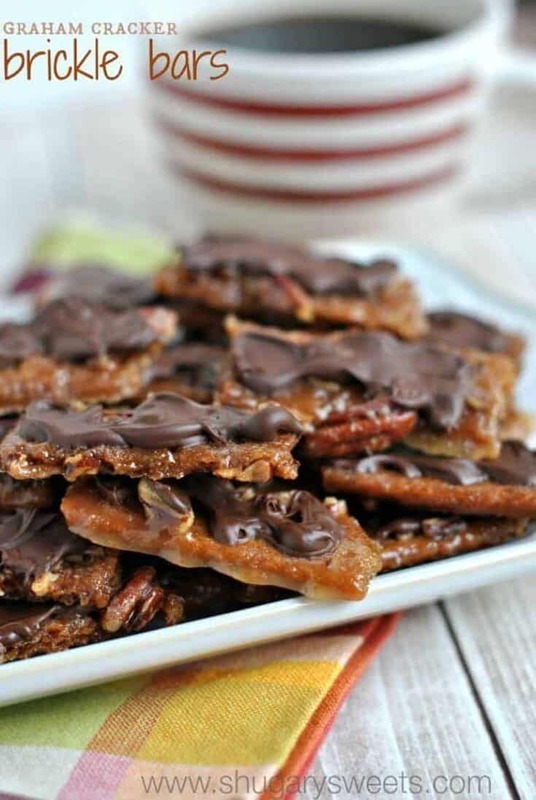 Pingback: Crock Pot Candy and a $800 Paypal #Giveaway - Chocolate Chocolate and More! You’re making a lot of extra work for yourself. It was be much easier to cover a sided cookie sheet with foil, spray with non stick cooking spray, and then proceed with your recipe through the baking part. When they come out of the oven, sprinkle with the chocolate chips so they melt from the heat of the bars. Spread the melted chocolate chips, and then let all cool. The entire sheet will lift off the foil. Then break they into rectangles, or abstract shapes. I like the looks of yours better than spreading the melted chocolate chips, so when the bars are cool, drizzle with the melted chocolate in a pastry bag. Then break into rectangles, squares, etc. I’m a little crazy about having perfect rectangles. But yes, you totally could try doing it that way and break into pieces. I like to serve things as pretty as I can make them, LOL. I leave grahams whole, place directly on sprayed cookie sheet, use brown sugar, and leave in oven exactly 7 min. before taking out and shaking choco chips out evenly, spreading with silicone spatula, and sprinkling walnuts (cheaper) on 1/2. Cool, use metal spatula to lift from underside which breaks them into variety of shapes. Easy. I’ve yet to understand why people read a recipe and then change it , after you (aimee) think of all these great recipe’s and give to us, so, generously. boggles my mind? amazing bars, great dessert. Thank you for sharing this delicious recipe with us. Um I so relate to ” Unfortunately she only ate one, now I have about 3 dozen more to eat. ” But these are definitely not the worst thing to eat!! Love all the textures/ flavors!! I am so glad I don’t have any graham crackers in this house. At least my Dr. is. I would be in the kitchen at this moment making these. But I do need to go o the grocery tomorrow. Oh my!! LOL. Aimee, have you ever tried this with Biscoff Cookies instead of graham crackers? If not, I will experiment and let you know. That sounds delicious….keep me posted! Mine were soggy what did I do wrong? My initial thought is you didn’t boil the mixture, or you didn’t bake it long enough? When they first come out of the oven they are soft. But within 15 minutes should crisp right up!